This year marks the 2500th anniversary of the Battle of Marathon on 12 September, 490 BC – the event that spurred the birth of the marathon footrace in 1896. The race is run on the same course from Marathon to Athens used for the 1896 and 2004 Olympic marathons (although it is probably not the route followed by the legendary messenger Pheidippides in 490 BC). The first Athens Marathon was held in 1955, and thereafter it was run every second year until 1967 when it became an annual event. Before 1955, however, other marathons were held on the course, such as the 1906 Intercalated Games Marathon and seven editions of the Balkan Games Championships. 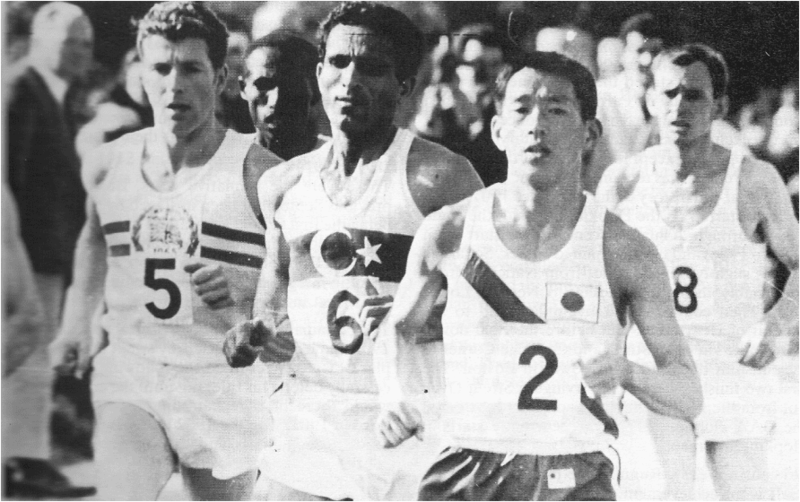 Although men such as Abebe Bikila and Buddy Edelen won the race between 1955 and 1968, the marathon really attracted international attention only in 1969 when Bill Adcocks (GBR) ran his brilliant time of 2:11:07.2. Over the next thirty-odd years some of the world’s best marathoners – Ian Thompson, Rodolfo Gomez, Gerard Nijboer, Douglas Wakiihuri and Abel Anton among them – would win the race, but Adcocks’ record stood untouched. It was only with the return of the Olympics to Athens in 2004 that Stefano Baldini (ITA) succeeded in finally wiping the record from the books when he clocked 2:10:55 to win the gold medal. The picture, from The Guinness Book of the Marathon, shows Adcocks (5) in his record race with Huseyin Aktas (TUR, 6) and Kenji Kimihara (JPN, 2).